Reflecting back on our Signature Bar Cookie Challenge on The Great American Baking Show, I made a Honey Corn Blackberry Basil Crumb Bar Cookie. My inspiration for this cookie came from mixing two things I LOVE into a cookie-- cornbread and pie! I'll have to admit, I'm not a huge fan of bar cookies but fell in love with this flavor combination of corn + fruit compote. Since I prefer eating regular flat crispy and/or chewy cookies, I made a new version today! Boy, were the results FANTASTIC! I am in love with the look of these cookies with the beautiful color swirling through them and large chunks of cherries peeking through. Couple of tips while making these-- 1) Make sure you use an ice cream scooper since it will be too soft to handle. 2) When you add in the cherry compote, stir with a spatula by hand and only a minimal amount of times so it's only a nice swirl of fruit on each cookie. The more you mix the fruit in, you'll lose that contrast. This is a super easy recipe that can be done from start to finish in about 2-2.5 hours. These also yield very delicious crispy edges with a chewy center type cookies. You get the sweetness from the corn and then a bit of tartness from the cherries which make for a yummy cookie unlike you've had before. Hope you enjoy these guys as much as my hubby does! 1. Add frozen cherries, lemon juice and sugar in a small saucepan and place over a medium heat. Cook for about 5-7 minutes until cherries have broken down. Add in corn starch and continue to cook until mixture has thickened. Set aside in a separate bowl and allow to come to room temp. (Or you can put in the fridge if you don't want to wait to get started on the rest of the cookie dough. 2. In a bowl of a stand mixer, add butters and sugar then cream together on medium high for 2 minutes until mixture is light and well mixed together. Scrape down the sides of the bowl with a spatula then add the egg and beat again for another 5 minutes. The mixture will get very fluffy with the egg. 3. In a separate medium bowl, add flour, corn flour, freeze dried corn powder, baking powder and baking soda. Whisk ingredients together. 4. With the stand mixer on low, add in the dry ingredients to the creamed butter, sugar and egg 1/2 cup at a time. Mix until everything comes together. You may need to keep mixing a little more by hand. 5. Remove bowl from the mixer since the next part you should only mix with a spatula in hand. Add half of the cherry compote and mix in with about 5 strokes in the batter. Add in the rest of the compote depending on how much cherries you want per cookie. Remember, you want this to be a swirl and not fully mixed in. Have a gentle hand during this part of the mixing and be aware of how many time you're folding the compote in the dough. 6. Portion out the dough using an ice cream scooper and place them on a parchment lined baking sheet. I like to use a 1 and 3/4 inch scooper which results in about a 3 inch cookie. Chill in the fridge for a minimum of 1 hour and up to 1 week. These cookies need to be fully chilled before baking. 8. Arrange 6 cookies on each baking sheet and bake two sheets at a time. See my post on Kona Mac Nut Cookies for how to space out the cookies. Bake for 14-17 minutes, rotating the pans once half-way through the bake time. Cookies will spread a good amount. They are done when the edges are browned and middle is still light colored. 9. Remove from oven and allow to cool on the baking sheet. Do not move them early since they need time to harden as they come to room temp. After 8 minutes, move cookies to a cooling rack and allow to come completely to room temp. Store cookies in an airtight container for about a week. It's been a few weeks since we got back from Hawaii and I'm doing just about anything I can to hang on to the sunshine, warmth and delicious food! I was lucky enough to pick up a bag of these beautiful Hawaiian macadamia nuts from the local market before leaving. One of the hubby's favorite cookies is a white chocolate mac nut cookie so no better time than now to tear into this bad boy! I adapted the recipe from Momofuku Milk Bar's Compost Cookie but reductions on sugar and different drop-ins. I am in love with how crispy the outside is and chewy the centers are. They also result in a very THIN cookie. This makes it fun to eat with ice cream or on their own. A few tips before starting... use an ice cream scooper for shaping your cookies. This is a very soft dough so don't bother using your hands to roll them. Also, keep in mind these cookies spread quite a bit in the oven so space them out properly. You can also bake two sheets at a time just make sure to rotate them (turn and switch racks) about 75% of the way through. Pre-bake: space out 6 cookies per sheet. 1. In your stand mixer bowl, add butter, sugars and corn syrup. Cream sugars and butter together using the paddle attachment on medium high for about 2-3 minutes. Scrape down the bowl then add the egg and vanilla extract. Beat again on medium high for another 6 minutes. 2. In a separate bowl, add your flour, baking powder, baking soda and salt. Whisk together to ensure they are well mixed together. 3. Your egg, butter sugar mixture should be very light and pleasantly whipped. Scrape down the sides of the bowl again and turn your mixer to low. Start adding your flour mixture about 1/2 cup at a time. Turn off mixer once the dough comes together. Shouldn't be more than a minute. 4. Now add the white chocolate, mac nuts and ground coffee to the dough. Again, only mix until all the dough comes together (about 30 seconds) and do not over mix. Scrape the dough together with a spatula. 5. Prepare 1 large baking sheet with parchment paper and grab your ice cream scooper. I like to use a 1 and 3/4 inch scooper which results in about a 4 inch cookie. Remember the larger scooper you go, the more you'll need to space out your cookies for baking. Start to scoop cookie domes to the baking sheet until all the dough is gone. 6. After all the cookies have been scooped, wet the back of your scooper and lightly press down each cookie so you flatten out the tops a bit. Next these cookies will need to chill for at least 1.5 hours or up to a week in the fridge. Wrap the baking sheet tightly in plastic wrap and go enjoy something on Netflix. 7. When you're ready to bake, preheat oven to 375 F.
8. Place the chilled cookie domes on parchment lined baking sheets spaced at least 4-5 inches apart. 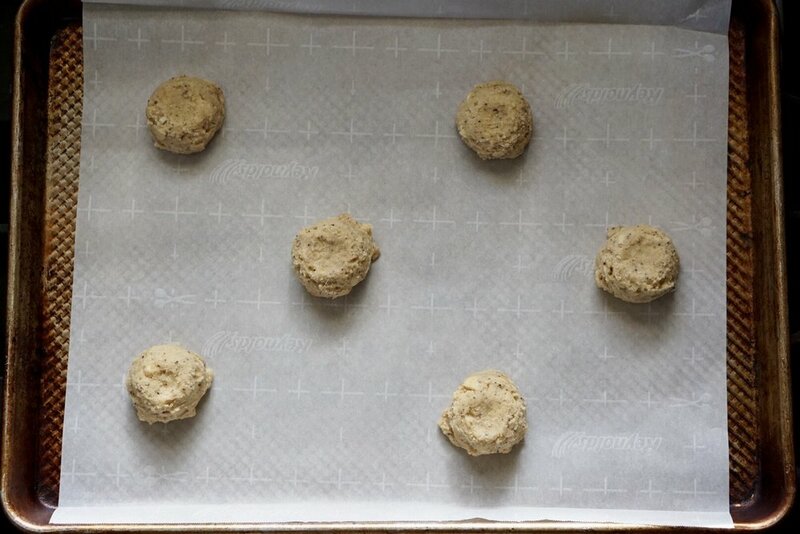 (See images above) You can fit about 6 cookies on each sheet and bake two sheets at a time. Keep cookies that aren't going into the oven yet in the fridge. 9. Bake for 16-18 minutes. about 13 minutes in, rotate the pans and switch levels if you're baking two sheets at a time. 10. Cookies are done when the outsides are a nice golden brown and the centers are still a bit blonde. Remove from the oven and cool cookies on the baking sheet for at least 5 minutes. If you try to move them too soon they'll completely fall apart. 11. Pour a glass of milk, or if you're like me, almond milk, and enjoy! Keep remaining cookies in an airtight container up to 5 days.